Delivery time: USA: 8-12 d, CA: 9-14 d, AU & NZ: 10-15 d, UK & Europe: 5-10 d, JP: 8-10 d, d = work days, dates only apply if you pay promptly with your order. Your country is not listed? Just ask! A pair of ostrich feather extensions with auburn and purple feathers for tribal fusion belly dance, goth look, larp and cosplay, boho stylings and fantasy weddings! Clip in extensions with 2 braids each and 7 carefully selected ostrich feathers each! The braids are ready to ship and made in color 1, darkest black with blueish touch, these are wonderful boho goth extensions! This is not the right hair color or not the right feather color for you? 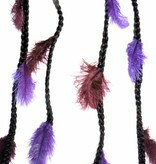 Then go to our custom color listing and order this braid headband as your custom match. You find the link to the original listing in related items, at the very bottom of this listing. The braids are sealed in their ends, so they will stay like you receive them and won't open any further. Naturally you can also wear these clip extensions in one of our hair falls of synthetic hair, in yarn falls or dreadlocks hair pieces or combine them with a hair tassel clip just like some pictures show you. 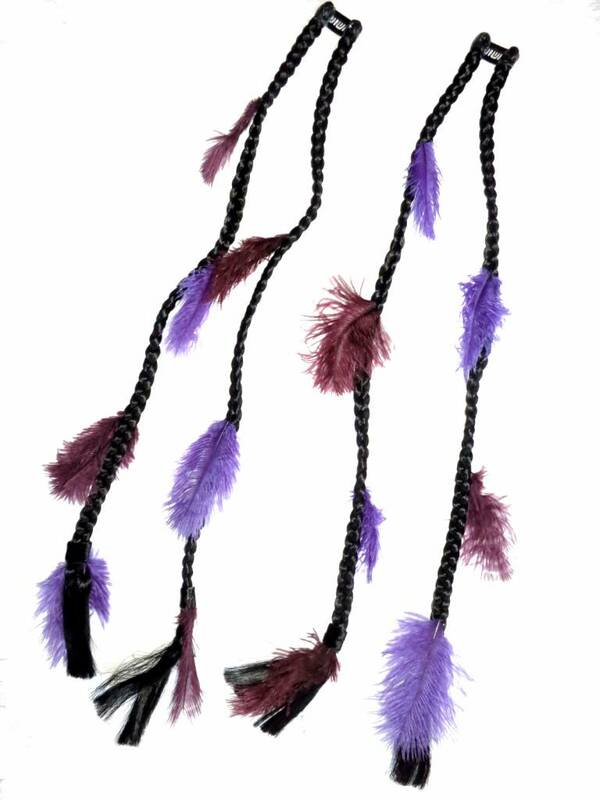 These feather hair pieces are really lightweight and very popular for tribal fusion belly dance, steampunk, Goth and boho look and costuming - perfect mermaid, shaman, amazon, fairy and magician hair for fantasy larp and cosplay costumes. Please understand that hair pieces cannot be returned for hygienic reasons! Read all details in our general terms and conditions. Just contact us for any questions about our ostrich feather extensions or any other fantasy hair piece!